Private car pickup at the Zagreb airport and transfer to the beautiful town of Zagreb. Check into your hotel. Overnight in Zagreb. Transportation:	private car/minivan/minubus depending on group size, driving time 20 minutes. Guided walking orientation tour of Zagreb, capital of Croatia. As the polit­ical, economic and cultural capital of Croatia with 770,000 inhabitants, the city throbs with energy but has retained a good deal of old-world graciousness. The sober Austro-Hungarian buildings in the town center house elegant restaurants and fashionable boutiques. The Lotrscak Tower was built in the middle of the 13th century in order to protect the southern city gate. For the last hundred years a cannon has been fired every day at noon commemorating an event from Zagreb's history. The tower may be climbed for a sweeping 360-degree view of the city. Near the tower is a funicular railway connecting the Lower and Upper Towns. Maksimir Park is a peaceful wooded enclave covering 18 hectares opened to the public in 1794. It is the oldest public cultivated park in Europe with alleys, lawns and artificial lakes. We visit the Zagreb Cathedral, whose twin spires soar over the city. The sacristy still contains a cycle of frescoes that date from the second half of the 13th C. Our walk through the old town takes us to colorful St. Mark’s Church, with its unique tiled roof constructed in 1880. The tiles on the left side depict the medieval coat of arms of Croatia, Dalmatia and Slavonia, while the emblem of Zagreb is on the right side. In late afternoon we depart towards Plitvice lakes for overnight. 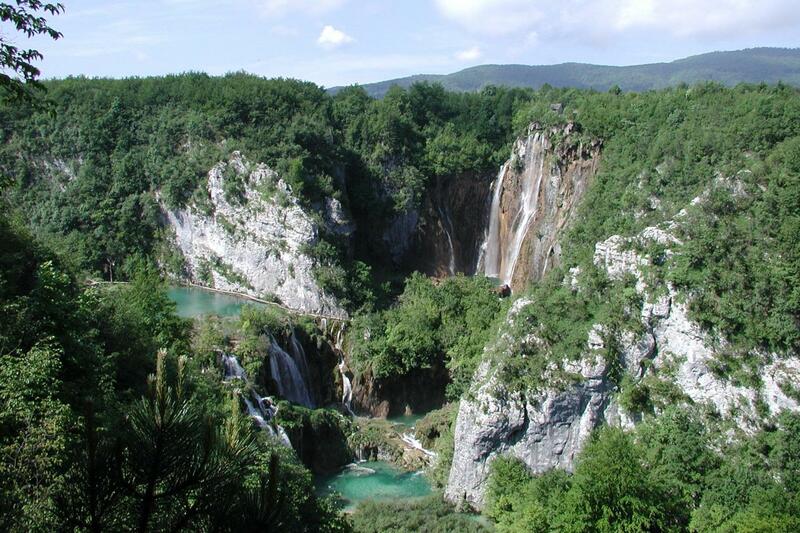 After breakfast time to explore spectacular national park Plitvice where sixteen lakes cascade from one to another in a series of waterfalls. Surrounded by dense woods and lush vibrant green undergrowth, the region is a UNESCO World Natural Heritage Site. Wander the paths and wooden boardwalks which follow the succession of lakes and waterfalls where streams burst out of the rocks. After walking in the park descend through the rugged mountains to the stunning Dalmatian Coast. Occupying the central 375km of Croatia’s Adriatic coast, the land known as Dalmatia encompasses Roman ruins, spectacular beaches, old fishing ports, medieval architecture and historic cities. On the way to Split stop in Zadar, an historic old town of Roman ruins, medieval churches, cosmopolitan cafes and quality museums set on a small peninsula with two unique attractions – the sound-and-light spectacle of the Sea Organ and the Sun Salutation – need to be seen and heard to be believed. Overnight in Split. After breakfast guided walking tour of Split. In 295 AD the Roman emperor Diocletian started building his palace and finished 10 years later. He spared no expense, importing marble from Italy and Greece, and columns and sphinxes from Egypt. A military fortress, imperial residence and fortified town, today the palace is a UNESCO World Heritage site and one of the most imposing Roman ruins in the western world. The transformation of the palace into the town began in the 7th Century when the inhabitants of nearby Salona took refuge in the palace during the invasions of the Avars and Slavs. Far from being a museum, the 220 buildings within the palace walls are home to about 3,000 people. With just the right balance of tradition and modernity, Split is the quintessential coastal town for exploring on foot and observing Dalmatian life as it’s really lived. The rest of the day and evening on your own are for you to enjoy the dozens of bars, restaurants and shops thriving amid the atmospheric old walls. Overnight in Split. After breakfast independent departure or you can extend your holiday with our Split to Dubrovnik tour.